Technology never stops evolving, and if you can’t keep up, you can quickly fall behind. At Clickback, we understand that we must constantly update our software solutions to provide the best possible results for our users. That’s why we’ve updated Clickback MAIL with added features for GDPR compliance, and made software updates that can improve the deliverability of your cold campaign. We’ve also streamlined our backend system to ensure a smooth user experience for existing and new Clickback MAIL customers. First, let’s cover the changes we’ve made to comply with new GDPR laws. Disclaimer: You should treat this post as a guide that will help you understand the basics of GDPR. This in no way should be taken as legal advice or guidance on what Clickback deems acceptable. If you’re looking for legal advice, contact a lawyer. GDPR stands for General Data Protection Regulation and is the new European Union Regulation that replaces the Data Protection Directive (DPD) and The UK Data Protection Act 1998. After many years of debate, it was approved by the EU Parliament on April 14th, 2016 and involves the protection of personal data and the rights of individuals. Its aim is to ease the flow of personal data across the 28 EU member states. GDPR grants expanded rights for individuals in the European Union by allowing them, amongst others, the right to be forgotten and the right to request a copy of any personal data stored in their database. GDPR requires organizations to report certain data breaches to data protection authorities and, under certain circumstances, to the affected data subjects. GDPR imposes additional obligations on organizations engaged in profiling or monitoring behavior of EU individuals. GDPR provides a central point of enforcement for organizations operating in EU or processing data of the EU individual member states by requiring companies to work with a supervisory authority for cross-border data protection issues. How did Clickback prepare for GDPR? Confirmed with our hosting provider that they are compliant and ready. Our hosting provider is SOC level 1 and 2 certified, which meets or exceeds the requirements for GPDR. All of our software and transfers of data between processing points are all encrypted using SSL. We have updated our import engines to filter out over 800 known EU domains that are used for personal type of email addresses (i.e. example@yahoo.co.uk) and will be updating accounts retroactively and marking such email domains appropriately. GDPR came into effect on May 25, 2018, and Clickback has made the necessary updates to our email lead generation software to give our users the tools they need to comply with these new laws. We’ve added a tool that allows you to remove specific EU contacts from your list on an individual basis. The new “Remove Recipients from all lists” function lets you quickly isolate and remove any EU email addresses from your bulk list to remain compliant with GDPR laws. Recipients can be re-imported and are available for non-list reporting. 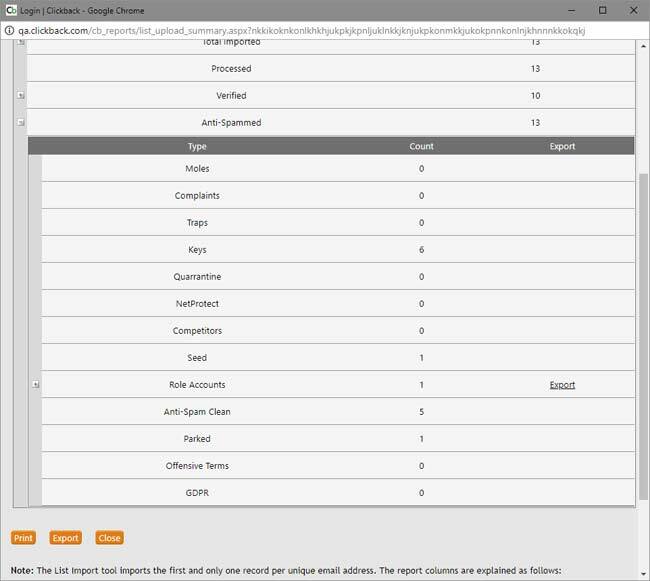 The Remove Recipients tool gives you an easy way to remove and delete all recipients and related data from all lists. This is a convenient way to delete all EU contacts from your contact list at once. It responsibly wipes all traces of the data in compliance with GDPR to ensure that your list is clean. Recipients cannot be re-imported and all reportable data will be removed. An email notification will be sent to you (or someone on your team) once the process has completed. If my company is based in the US, do I have to be GDPR compliant? This will depend on a number of factors. GDPR is designed to protect EU citizens, so it’s not dependant on your companies physical location. GDPR is about whose personal data you process. For example, if your company is based in the United States, but some of your clients, partners, subscribers, and prospects are EU citizens, you should process their data in a way that is compliant with GDPR. This is your obligation as a data administrator. Should all outbound emails have an unsubscribe option included as mandatory now? Clickback’s software enforces that all emails have an opt-out link. This was a requirement to be CAN-SPAM compliant. You are not able to send an email without an opt-out link. I send several email campaigns a year. Do I need to stop doing that when the GDPR comes into effect? No. The GDPR has not been designed to eliminate outbound email marketing or cold emails. It is not a regulation about emails, marketing, or business. The GDPR’s primary goal is to protect personal data. However, sending outbound email campaigns, B2B marketing, and running a business means that you likely process personal data. Can I send cold emails to people under GDPR? Yes, you can send cold emails to people at companies under GDPR. They need to be B2B emails that meet certain requirements. You can’t send them to just anyone. You need to target your B2B prospects carefully. You’ll need to have a strong reason to claim that the company the person works for can benefit from what your company offers in the email. This has been a strategy we have recommended at Clickback from day one, so if you’ve been following our advice, there shouldn’t be any changes on your end. Your business activity should be logically connected with the business activity of your prospect. That will be a legal basis to send someone an email without their previous consent to process their data. In each of your email messages, you need to inform your cold email recipients of the personal data you are processing, for what purpose, and how they can remove their data from your mailing list, or change them. That’s how you fulfill the information duty described in GDPR. You should not process your cold email addressees’ personal data for longer than it’s necessary. GDPR does not specify any particular period of time. This is how you abide by the data storage limitation principle while sending cold emails. Is keeping a list of contacts in Clickback making me the owner/processor of the personal data? When you upload a list of prospects into Clickback, the prospect whose personal data you process is the owner. You are, in that case, a data administrator. You decide whose and what kind of data personal data you want to process. Moreover, you’re responsible for adhering to the storage limitation principle. The storage limitation is a principle that was introduced by GDPR. It means that you cannot process the data longer than necessary for the purpose of processing it. Additionally, what comes from that is that you need to respect the personal data owners wish to be deleted from your prospect list and not being contacted ever again. You’re being held accountable if you abuse the storage limitation principle as well as any other GDPR principle. Clickback becomes the data administrator when it processes your personal data as the app user or a newsletter subscriber. It should treat your data with due care. What is important is that GDPR introduces a new principle of data storage limitation, which does not allow you to process personal data longer than it’s necessary. The exact amount of time is not specified in the document. Any kind of data you ask for should be justified by the purpose for which you want to process it. Don’t ask for a phone number if you want to send someone an ebook. If you want to collect their phone number, tell them up-front that you may want to call them. Our customer success managers are here to help. They are not only willing to help you understand the best ways to utilize our software for lead generation, but they listen to your feedback. We take your valuable feedback and use it to constantly improve our lead generation software to serve you better. 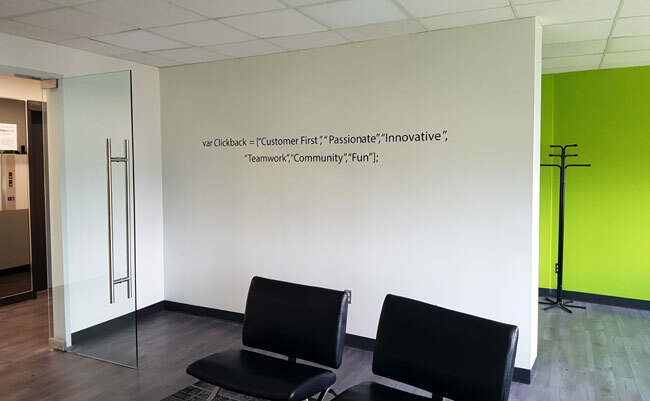 The word wall in the Clickback office foyer. The software is now better at delivering your messages and provides you with new tools to stay on top of the ever-changing laws involved with unsolicited email marketing. This means that you can continue generating more B2B leads for your business by safely sending outbound email campaigns to a purchased list. Maximizing the deliverability of your cold campaigns is our number one priority, so we’ve given Clickback MAIL the updated features and functionality to reach the inbox of your purchased list. We all know how important deliverability is when it comes to outbound email marketing. Sending cold campaigns to third-party list creates a world of challenges for marketing and sales teams, which is why we’ve adapted to the latest deliverability roadblocks and challenges. For the best results, we have encouraged clients over the years to send one campaign, versus sending many smaller campaigns in rapid succession. This can cause what is known as snowshoeing, and can negatively impact the ROI of your campaign. In order to improve the deliverability of your email campaigns, Clickback has introduced the following updates to our sending platform. Now, when you select “Send Now” Clickback MAIL will automatically check to see if you have a campaign scheduled within a 3-hour window. If there is a conflict, an interactive calendar will appear to show you the next available time to send your campaign. The calendar will also appear if you want to schedule your campaign for a later date or time. The updated sending process helps us ensure the best possible deliverability of your cold campaign, and more importantly, your return on investment. Even with the changes to the sending schedule, we still encourage customers to send one campaign to multiple lists. Clickback creates software solutions such as Clickback MAIL and Clickback WEB to accelerate B2B lead growth. Our team of software developers works tirelessly to improve our products so that our users can fully appreciate the benefits of our lead generation software tools.